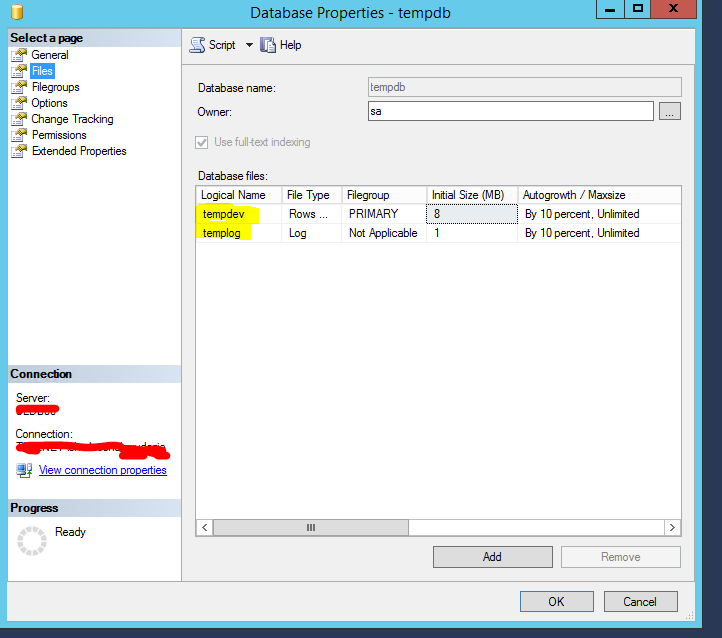 Moving TempDB Database Files on MSSQL 2012 R2. | Chinny Chukwudozie, Cloud Solutions. ← Uninstalling Software with Powershell. Moving TempDB Database Files on MSSQL 2012 R2. I ran into a disk space situation on a new database server and decided to move the Tempdb files to a new drive location. My first thought was to detach the database and move the files. It turns out you can’t detach a tempdb database since it’s a system database. The following T-SQL query helped achieve the task. Login to SQL2012 Management Studio. Expand the Databases tree and expand the system databases tree. Select and right-click on the TempDB database. Restart the SQL Instance after the move. I verified that the file path was changed . I finished by removing the old temp files from the previous location. This entry was posted in MSSQL 2008 R2, MSSQL 2012 and tagged MSSQL 2008 R2, MSSQL 2012 R2, Transact-SQL. Bookmark the permalink.